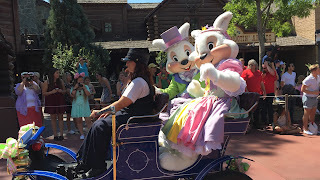 Today and tomorrow, Disney is featuring an Easter "pre-parade" at the Magic Kingdom. It is a short set of characters and floats that is highlighted by Mr. and Mrs. Easter Bunny. I took this shot at the 12:00 parade today.